Growth in Bizkaia was above the average, at 3.4%, while in Alava (2.4%) and Gipuzkoa (1.8%) the performance was more modest. The retail trade sector in the A.C. of the Basque Country increased its sales in the first quarter of 2004 by 2.8% with respect to the same period of last year in nominal terms, according to Eustat data. This nominal growth translates into a similarly positive evolution of 1.8% in real terms. Retail trade in medium and large stores (non-specialised) grew 5.5% in the first quarter of the year in nominal terms. Once the effect of price rises is discounted, the variation of the inter-annual rate was 2.1%, compared to the same quarter of last year. Traditional retail trade (specialised) increased its nominal sales by 1.3% in the first quarter of 2004, in relation to the same period of 2003. This nominal rise becomes 1.6% growth in real terms taking the evolution of prices into account. By province, the highest growth in nominal sales for the retail trade sector in this first quarter took place in Bizkaia, with an inter-annual rise of 3.4%, due to the dramatic rise in non-specialised retail trade (5.7%); next came Alava with a positive variation of 2.4% in the general index, while Gipuzkoa obtained more modest growth of 1.8%. In real terms, the increases were 2.4% in Bizkaia, 1.0% in Alava and 1.0% in Gipuzkoa. 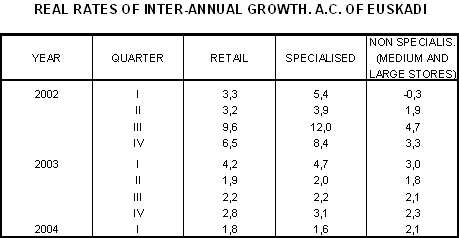 As for personnel employed by the retail trade sector in the first quarter of 2004, there was an inter-annual increase (in relation to the same quarter of last year) for the A.C. of the Basque Country as a whole of 1.7%, which breaks down by provinces as follows: in Alava there was a 3.6% increase, in Bizkaia it was 2.1% and in Gipuzkoa it was 0.3%.